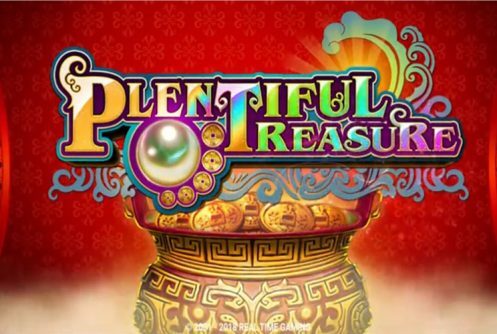 Plentiful Treasures is a RealTine Gaming medium to high variance progressive video slot machine with 5 reels, 243 All Ways Pays (pays from left to right and vice versa) that pays a top jackpot of 50,000 coins on a single spin. 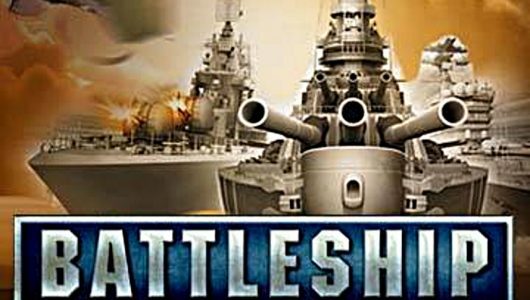 We’ve lost track the amount of Chinese themed slots developers released over the years. Then again they won’t keep on releasing them if they aren’t popular with players. It’s not only the visual side of Plentiful Treasures that looks great. 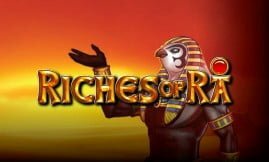 It’s packed with 4 different jackpots known as the Golden Coin feature (MINI, MINOR, MAJOR and GRAND) and a Free Spins bonus where the symbols are high value allowing players to cash in on those big wins. The symbols on the reels feature prominently in Chinese folklore, you’ll see a boa (Wild), bowls, casket, rings, pearl, necklaces, teapots, tripod (scatter) and cards from 9 to Ace (low value). The symbol that carries the most weight is the Pearl Wild, attached to it is a multiplier of 5x. RTG did not publish the RTP of Plentiful Treasures, if we can give an estimate it’s around the 95% mark. The slots has two wilds namely the Boa (means treasure in Chinese) and the Pearl. Both of them appear only on reels 2, 3 and 4 – they replace regular symbols that’s adjacent to them bar the scatter. The free spins bonus is played when 3 tripod scatters appear on the reels during the base game, 8 free spins are awarded. 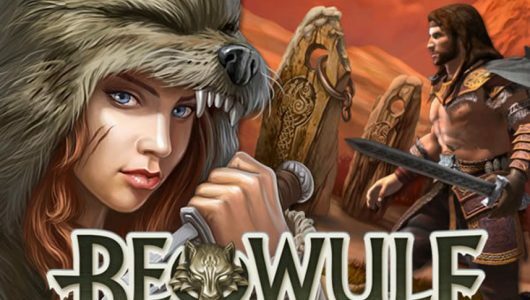 The wilds (boa and pearl) can appear on each free spin, plus only high value symbols pitch. Of the two wilds the Pearl is the most important because it carries a multiplier of 5x making it a potentially rewarding feature. Without a doubt this is the business end of the slots because this is where the progressive jackpot is won. Each jackpot MINI, MINOR, MAJOR and GRAND is represented by four gods. 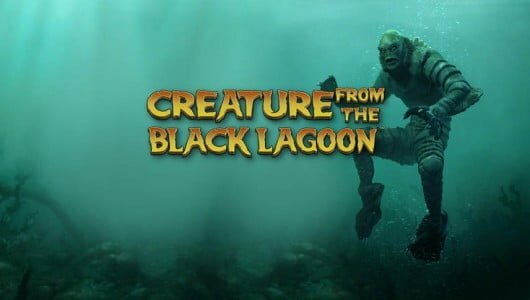 The Gold Coin bonus is triggered when the Boa and the Pearl wilds pitch on the third reel – a new screen opens up showcasing 12 Gold Coins. Here you must pick 3 matching deities if you succeed you’ll win one of the four jackpots! 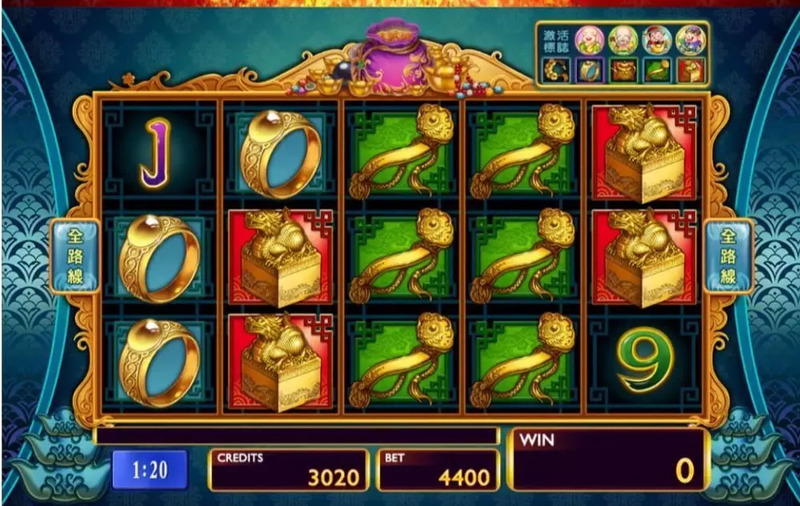 Plentiful Treasures is not only a land-casino slot machine it’s now an online one too. It’s an exciting game since it comes with a re-triggerable free spins feature and 4 progressive jackpots. Keep an eye on the Pearl wild too; all wins are multiplied by 5x. How would you describe the game’s volatility? It is a progressive that has 4 jackpots (Mini, Minor, Major and Mega), as a result it’s quite high up on the volatility scale. The good news is that it belongs to RTG’s progressive jackpot pool – every time it’s played the jackpots get bigger and bigger. 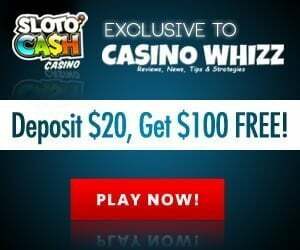 Can I trigger the free spins within 40 spins? It’s possible but unlikely because we’re talking about a progressive here. The bigger the jackpot prize of a slot machine the harder it is to trigger its in-play bonus rounds. If we can give a more feasible estimate, work on triggering the free spins within 80 spins or more. Decide on a coin range and stick to it. This is a progressive to get the most out of it you must up the ante a bit.